An informal weekly event known as “Monkey Mondays” at Carrabba’s Italian Grill in Stuart was cancelled after an 8-year old boy was bitten by one of two pet monkeys brought by a local couple. However, those days are over after a 9-month-old Capuchin named JoJo bit an 8-year-old boy on the finger. On July 16, the Herald states, JoJo the monkey’s owners warned an 8-year-old boy and his father who were dining on the patio that the monkey was “being hyper.” The boy then pet the monkey, who was seated in a high-chair at the table. When the boy returned to pet JoJo again later in the meal, the monkey bit the boy on his pinkie finger. Florida Fish and Wildlife Conservation Commission investigated the monkey owners’ home, which they found to be a “safe and adequate environment” for the five monkeys the couple owns. But the FWC did cite the owners for not having JoJo’s rabies shots up to date; the owners say their veterinarian mistakenly told them the rabies vaccine wasn’t required. They have since updated his rabies vaccine, the Herald reports. On Saturday, August 11, 2018, deputies were called to San Jose Elementary School located at 1670 San Helen Drive in Dunedin, for a report of an injured gopher tortoise. Deputies say a concerned citizen reported the injured tortoise found in the bus circle at the school. It appeared the tortoise had been run over by a vehicle. A representative from the Owl’s Nest Sanctuary for Wildlife responded and took possession of the injured tortoise that later died. Deputies obtained surveillance video from the school that depicted a light colored Acura TSX drive over the tortoise in the bus circle. On Wednesday, August 15, 2018, deputies placed the surveillance video of the incident on the Sheriff’s Office’s social media website in an attempt to identify the driver of the vehicle. According to deputies, 48-year-old Robert Dantschisch, saw the video on television and he contacted the Sheriff’s Office to identify himself as the driver of the vehicle. Dantschisch has been employed by the Pinellas County Sheriff’s Office for approximately three weeks and is assigned as a school crossing guard for San Jose Elementary School. Dantschisch told deputies that on Saturday, August 11, 2018, he drove his 2013 Acura TSX to San Jose Elementary School accompanied by his wife, 46-year-old Dawn Dantschisch. Dantschisch explained that Monday was the first day of school and he was being assigned to San Jose Elementary School as a crossing guard. Dantschisch said in preparation for the first day of school, he and his wife were driving the route to his new school assignment and he wanted to confirm the school start and end times. Dantschisch told deputies he drove into the school’s bus circle and stopped to see the school start times on the marquis sign. He proceeded driving forward but continued looking back at the sign when he ran over an object in the roadway. As Dantschisch continued driving forward he looked into his rear view mirror and saw that he struck what he thought was a tortoise. Dantschisch said he did not see the tortoise until after he ran over the animal. Dantschish’s wife corroborated Dantschisch’s statement. Deputies conducted a reenactment of the events at the scene and concluded that Dantschisch’s actions were accidental; there is no evidence to indicate that Dantschisch intentionally drove over the tortoise. There is no evidence that a crime was committed and the case is being closed. 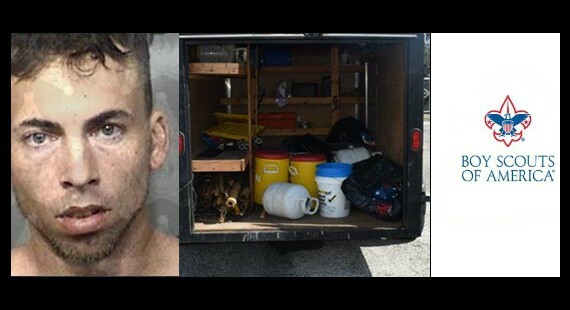 Police arrested, Stephen Joseph Petnel 36, of Melbourne, FL after he confessed to stealing a Boy Scouts of America Troop trailer. Melbourne Police say they were able to locate the Boy Scout trailer on Wednesday, Aug. 15 after verifying the VIN number on the trailer. 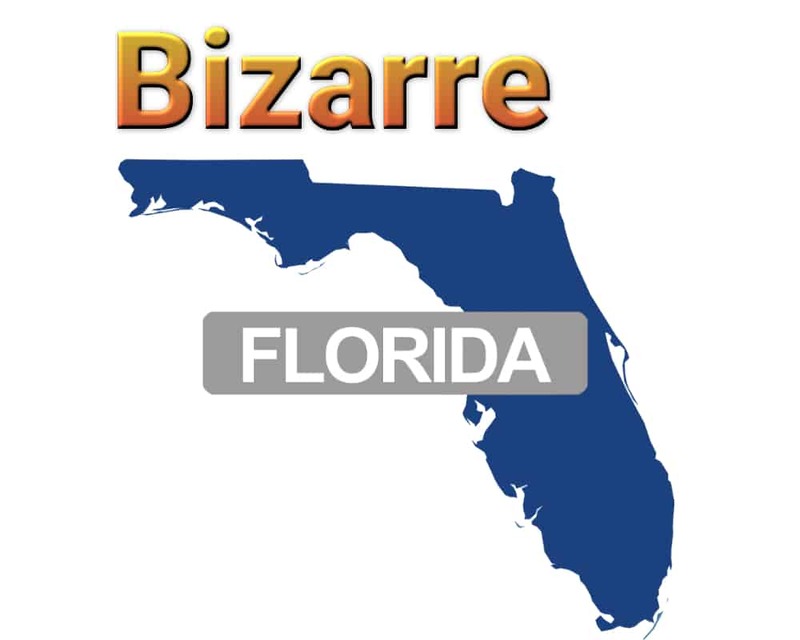 The trailer had been painted and the Boy Scout lettering was removed by Petnel to hide the trailer, according to police, according to Space Coast Daily. Petnel was charged with two counts of Grand Theft, possession of burglary tools and removing/altering personal property. 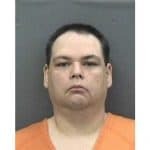 The Pensacola News Journal reports that Suhor, a member of the West Florida Chapter of the Satanic Temple, was arrested during a February ECUA meeting and charged with trespassing and resisting arrest without violence. During Suhor’s sentencing, a judge sentenced him to three months probation. According to ECUA Chairwoman Lois Benson, the board holds a prayer before the meeting officially starts. Suhor approached the dais and continued to recite the “Lord’s Prayer” after Benson tried to start the meeting. Officials say a deputy and a security guard had to drag Suhor from the meeting. Suhor drew national attention in 2016 when he delivered a Satanic prayer before the Pensacola City Council. Eustis Police responded a call regarding a shoplifter at a local Publix on Monday. 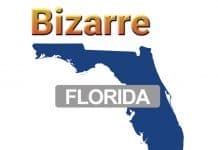 According to WKMG News 6 and Eustis Police, suspect Bobbie Talmadge, who originally gave police the alias of Betty Blanton before telling them her real name, said she had been dropped off by her neighbor who asked her to steal food for a cookout later in the day. 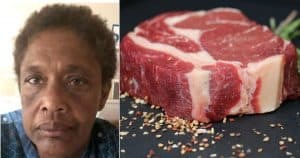 According to arrest records, the store’s security observed her concealing packages of meat and two spray-on deodorants into her pants and purse. Talmadge passed all points of sale and exited the store before she was stopped, police say. Publix’s loss prevention officer on site provided a tab for the stolen items, which included two New York strip steaks, a ribeye steak, a Porterhouse steak, T-bone steak cuts and Publix chicken wings, totaling $121.37.Talmadge was charged with petty theft with two or more convictions and providing a false name to law enforcement. A septic tanker truck driver allegedly dropped one of the largest illegal dumps in Polk County history. According to reports from the Lakeland Ledger and Polk County Sheriff Grady Judd, Peter Rodriguez is accused of purposely spilling about 10,000 gallons of brown-and-orange slick sludge of used cooking oil underneath the palm and pine trees in a vacant lot along U.S. 27 in Davenport. According to the Polk County Sheriff’s Office, their agricultural arimes detectives arrested Rodriguez after they found him at a nearby Dollar General store — cooking oil leaking out of the drain spout of a pump truck they determined he was operating. 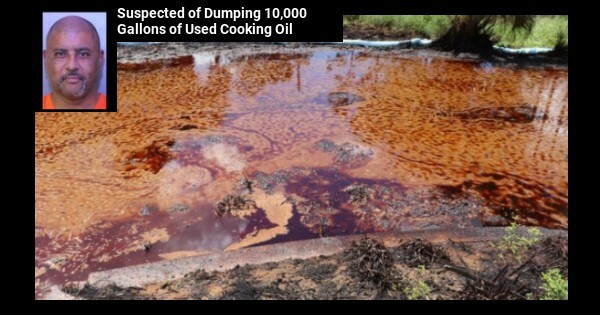 According to detectives, Rodriguez eventually admitted to dumping the sludge but said he “had to do it to keep his job.” Brownies Septic and Pumping, his employer, told deputies Rodriguez had no need to dump the oil in the vacant lot because the company picks up the oil from various locations and then disposes of it at its place of business in Orlando where it is refined and sold. An online conversation went offline and out of hand in Tampa after one man allegedly shot a Facebook friend over a political dispute. 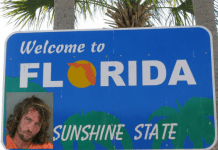 According to the Tampa Tribune, Brian Sebring was charged aggravated battery with a deadly weapon and carrying a concealed firearm. Sebring fired two shots, hitting Stephens in the right thigh and buttocks. Sebring surrendered to police and has been charged with aggravated battery with a deadly weapon and carrying a concealed firearm. Stephens is expected to recover from his injuries. Seminole County Sheriff’s Office’s helicopter team and Sanford’s Police department got a friendly assist from several cows. Authorities were in pursuit of Jennifer Anne Kaufman, who was riding in a white Subaru with a reportedly stolen tag. Kaufman, 46, was in the car with two others: Erin Leigh Thomas, 38, and Jamie Michael Young, 46, according to the Sanford Police Department’s arrest report. Police told WKMG News 6 in Orlando that Young ran into a pasture to the east and Kaufman ran into a cow pasture to the south of the crash. Another passenger stayed at the crash scene and was arrested, according to police. Young was found hiding in some bushes and arrested with the help of K-9s, according to the report. As the video above shows, the Seminole County Sheriff’s Office aerial alert team continued to track Kaufman running through the cow pasture, where she encountered approximately 20 cattle that corralled her for authorities to apprehend.